When chicken fried steak shows up on the weekly menu at Trebo — the on-site restaurant at Salt Lake City’s O.C. Tanner Co. — Blake Irvine and his co-workers start the countdown. In addition to generous health benefits and 401(k) packages, savvy Utah Top Workplaces, such as O.C. Tanner, have learned that food — whether it’s an on-site cafe, stocked refrigerators, an occasional free lunch or a “treat trolley" — can boost employee morale, productivity and longevity. 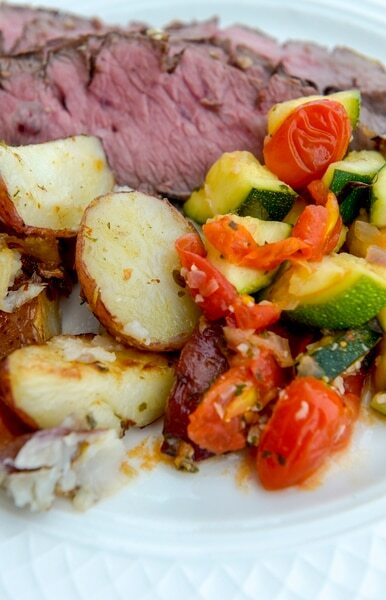 Leah Hogsten | The Salt Lake Tribune Sliced Flank Steak with red potatoes and sautéed zucchini with red grape tomatoes, $5 at O.C. Tanner's in-house company restaurant, Trebo, Oct. 19, 2018. O.C. Tanner is keeping their employees comforted through their stomachs. Trebo, an on-site restaurant that serves hearty breakfasts, lunches and dinners made from scratch and serves snacks and free drinks all day. Leah Hogsten | The Salt Lake Tribune l-r Denis Mlikota and Dan Jensen confer on a project after eating lunch at O.C. Tanner's company restaurant, Trebo, Oct. 19, 2018. O.C. Tanner is keeping their employees comforted through their stomachs. Trebo, an on-site restaurant that serves hearty breakfasts, lunches and dinners made from scratch and serves snacks and free drinks all day. 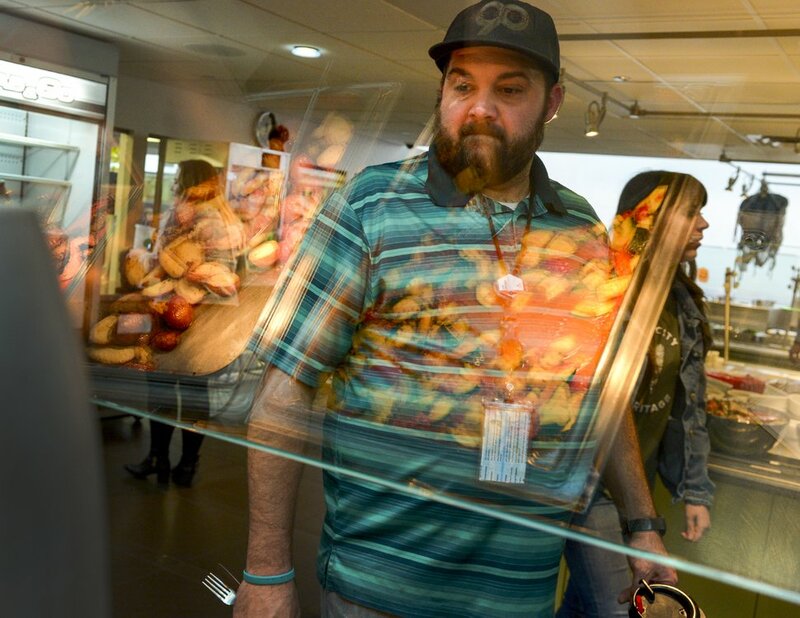 Leah Hogsten | The Salt Lake Tribune Employees gather for lunch at O.C. Tanner's company restaurant, Trebo, Oct. 19, 2018. O.C. Tanner is keeping their employees comforted through their stomachs. Trebo, an on-site restaurant that serves hearty breakfasts, lunches and dinners made from scratch and serves snacks and free drinks all day. Leah Hogsten | The Salt Lake Tribune We're always told that we are the heart of the company, said sous chef Pamela Moser, who sets aside flank steaks and red potatoes hot from the convection ovens at O.C. Tanner's company restaurant, Trebo, Oct. 19, 2018. O.C. Tanner is keeping their employees comforted through their stomachs. Trebo, an on-site restaurant that serves hearty breakfasts, lunches and dinners made from scratch and serves snacks and free drinks all day. Leah Hogsten | The Salt Lake Tribune An employee eyes sliced flank steak with red potatoes and sauted zucchini with red grape tomatoes for $5 as he views the day's lunch offerings at O.C. Tanner's in-house company restaurant, Trebo, Oct. 19, 2018. O.C. Tanner is keeping their employees comforted through their stomachs at the company restaurant, Trebo, Oct. 19, 2018. Trebo, an on-site restaurant that serves hearty breakfasts, lunches and dinners made from scratch and serves snacks and free drinks all day. Leah Hogsten | The Salt Lake Tribune Pastry chef Kristina Fox whips up a batch of frosting to top the sheet of carrot cake she made earlier from scratch at O.C. Tanner's company restaurant, Trebo, Oct. 19, 2018. O.C. Tanner is keeping their employees comforted through their stomachs. Trebo, an on-site restaurant that serves hearty breakfasts, lunches and dinners made from scratch and serves snacks and free drinks all day. Leah Hogsten | The Salt Lake Tribune Fried cod sandwich with tartar sauce and waffle fries for $4.50 at O.C. Tanner's company restaurant, Trebo, Oct. 19, 2018. O.C. Tanner is keeping their employees comforted through their stomachs. Trebo, an on-site restaurant that serves hearty breakfasts, lunches and dinners made from scratch and serves snacks and free drinks all day. Leah Hogsten | The Salt Lake Tribune Executive Chef Frank Mendoza, oversees Trebo restaurant and its 18 employees, crafting its daily changing menu and serving 750 meals a day, Oct. 19, 2018. O.C. Tanner is keeping their employees comforted and happy through their stomachs. Trebo, an on-site restaurant that serves hearty breakfasts, lunches and dinners made from scratch and serves snacks and free drinks all day. Leah Hogsten | The Salt Lake Tribune Tina Goyen, a 35-year employee at O.C. Tanner said she likes the daily variety of working at Trebo, Oct. 19, 2018. O.C. Tanner is keeping their employees comforted through their stomachs. Trebo, an on-site restaurant that serves hearty breakfasts, lunches and dinners made from scratch and serves snacks and free drinks all day. Leah Hogsten | The Salt Lake Tribune A dish of poached salmon with herbs, lemons and red onions served over a bed of rice with sauted green beans at O.C. Tanner's company restaurant, Trebo, Oct. 19, 2018. O.C. Tanner is keeping their employees comforted through their stomachs. Trebo, an on-site restaurant that serves hearty breakfasts, lunches and dinners made from scratch and serves snacks and free drinks all day. The food perks are as different as the companies that offer them. 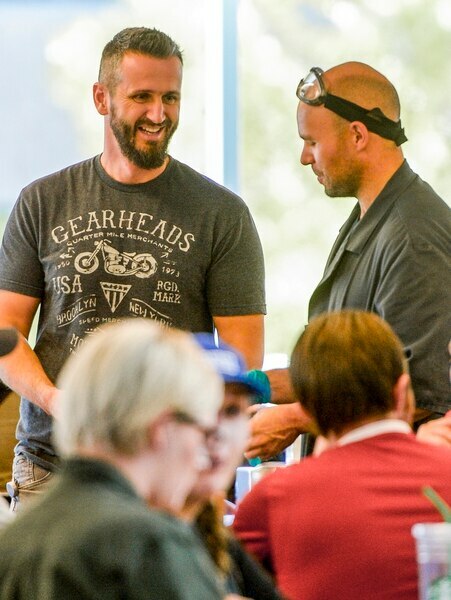 Recursion Pharmaceuticals • This biotechnology company that moved into its news Salt Lake City headquarters at The Gateway in October provides a free lunch for all 100 employees each workday. Plus, it keeps a kitchen area full of snacks and drinks. Also free. Workfront Inc. • The Lehi software company has Food Truck Fridays. Employees receive a voucher for a free meal from their truck of choice. 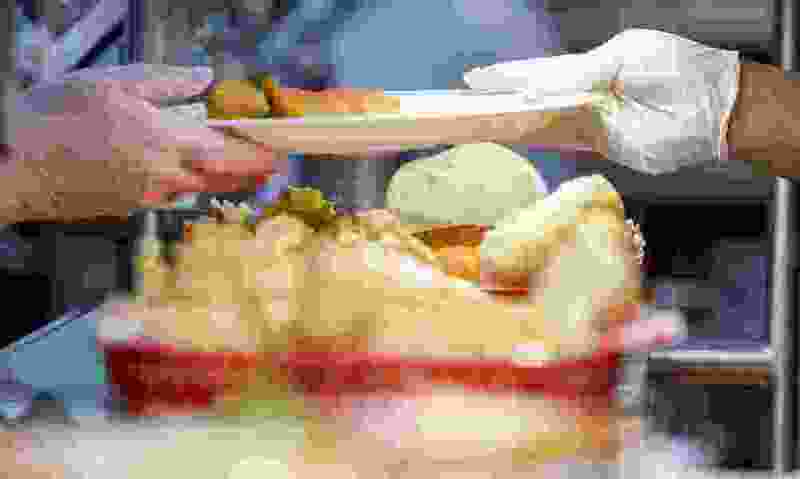 Rhodes Bake and Serve • Employees of the Murray-based frozen-dough company can get free bread and rolls. To offset all those carbs, the company also has fruits and vegetables, a nutritionist, a personal trainer and exercise classes. MX • No one goes hungry at this Lehi financial technology company. There are free bagels on Monday, catered lunches every Tuesday and Thursday, and smoothies on Wednesday. All that on top of the break room that’s stocked with healthy — and not-so-healthy — beverages and snacks. 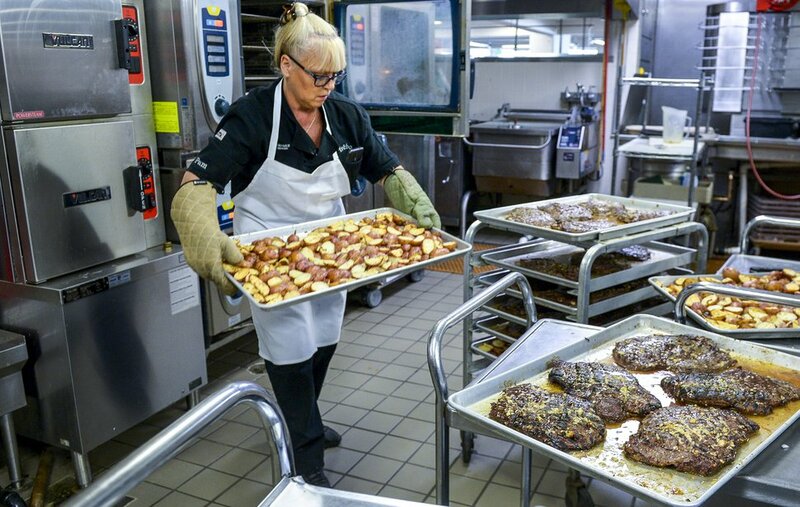 Leah Hogsten | The Salt Lake Tribune "We're always told that we are the heart of the company," said sous chef Pamela Moser, who sets aside flank steaks and red potatoes hot from the convection ovens at O.C. Tanner's company restaurant, Trebo, Oct. 19, 2018. O.C. Tanner is keeping employees comforted through their stomachs. Trebo is an on-site restaurant that serves hearty breakfasts, lunches and dinners made from scratch and serves snacks and free drinks all day. O.C. 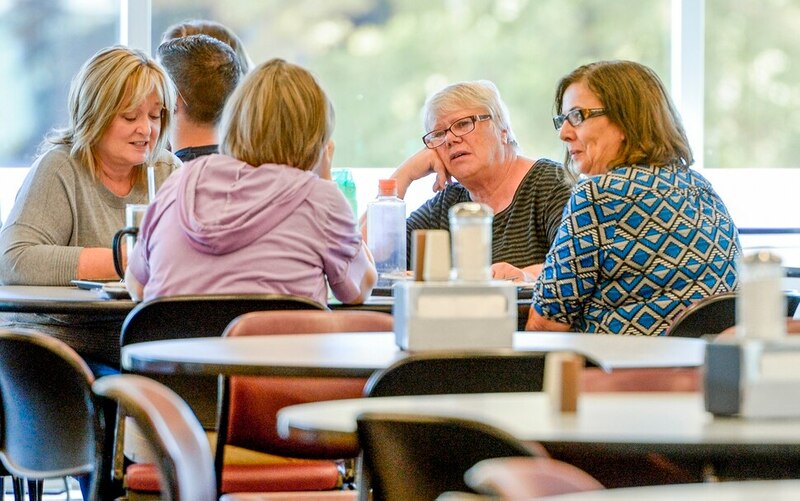 Tanner — which initially produced high school rings and pins when it started in 1927 — has had an employee eatery for decades, said Denise Page, director of employee relations. In the beginning, it was cafeteria-style catering to the manufacturing employees, who had 30-minute lunch breaks. Through the years, the Salt Lake City company has expanded its reach and now offers recognition and service award programs to companies across the globe. More than half of its 1,200 Utah employees work in client services, marketing, sales and finance. Twelve years ago, to go along with the business change, the company remodeled the cafeteria and created an on-site restaurant with food stations, an expanded menu and an updated dining area. Open for breakfast and lunch, it’s called Trebo — Obert spelled backward and a nod to founder Obert C. Tanner. Chef Frank Mendoza, who previously worked at Log Haven, Stein Eriksen and the now-closed Metropolitan, runs the kitchen with about 18 employees. The company subsidizes the restaurant, paying for the cost of the building, equipment and labor, Mendoza said. Employees cover the food costs. All the drinks — from coffee to tea to soda — are free. Depending on the day, employees can get grilled salmon for $5, lemon fettuccine for $4 or a Reuben sandwich for $3.75. Leah Hogsten | The Salt Lake Tribune An employee eyes sliced flank steak with red potatoes and sautéed zucchini with red grape tomatoes for $5, among the day's lunch offerings at O.C. Tanner's in-house company restaurant, Trebo, Oct. 19, 2018. O.C. Tanner is keeping employees comforted through their stomachs at the company restaurant, Trebo, Oct. 19, 2018. Trebo is an on-site restaurant that serves hearty breakfasts, lunches and dinners made from scratch and serves snacks and free drinks all day. Warm and welcoming, Trebo features a long wall of windows that look east onto State Street and the Salt Lake County Government Center across the street. Between meals, it’s a gathering place for workers who want to celebrate a birthday, hold team meetings or host potential clients. ”It’s the heart of the company,” said Pam Moser, who has worked in the Trebo kitchen for more than a decade. “Employees can come and relax and be well-fed." 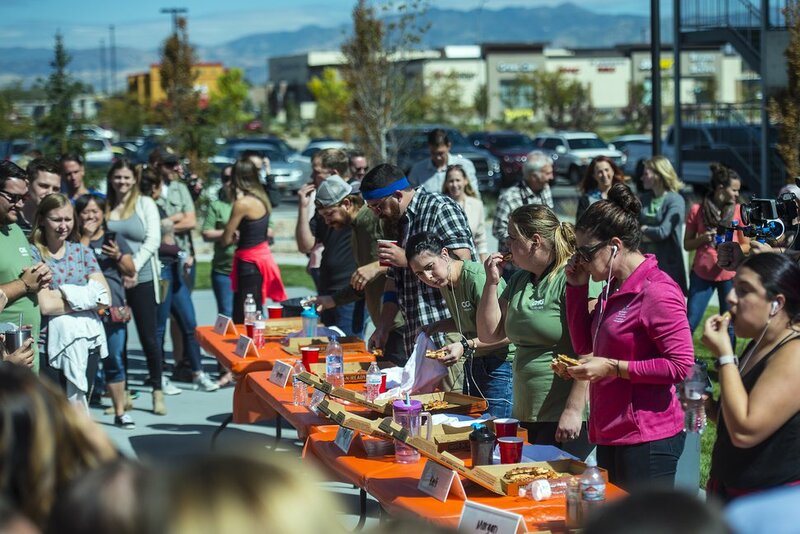 (Chris Detrick | The Salt Lake Tribune) Employees compete in a pizza-eating competition during a fundraiser for United Way at CHG Healthcare on Wednesday, Sept. 20, 2017. Food is a central part of the culture at CHG Healthcare, a health care staffing provider based in Midvale. When CHG was planning its new company headquarters, which opened in August 2017, it conducted extensive surveys to find out what employees wanted. There was a clear message that they wanted food options that were convenient, healthy and varied, VanCampen said. The result was the creation of a subsidized cafe called The Kitchen. Soup, salads, sandwiches and pizza are available every day, with a rotating menu of entrees, many with international flavors such as kung pao chicken and vegetable curry. Refrigerators and microwaves are on hand for those who bring their lunch. There also is a market area with self-serve yogurt, grab-and-go lunches and meal bars. “We hit the gamut on what people need in the workplace,” VanCampen said. Once CHG employees get their food, they head to the People Hub, a large open area with high ceilings and walls of windows. Besides being a place for lunch, it’s where people have staff meetings and the company hosts large celebrations. The new company cafe at Recursion Pharmaceuticals helps employees who work on an array of biotechnology projects feel connected, said Brooke Clark, director of talent acquisition. “There are 100 of us in a 100,000-square-foot facility,” she said. “Eating together really helps bind our culture and maintain relationships. We’ve had a lot of really great ideas come out of a brainstorm at lunch." Having a food-filled break room or an on-site cafeteria didn’t make sense, she said, because about 30 percent of the employees work remotely. But once a month, the midsize company with about 350 employees gathers for a company-paid lunch. That’s not to say that there aren’t the occasional office treats, like flavored sodas or Creamies, CEO Ben Peterson’s favorite made-in-Utah frozen ice cream treats. Giving food to those less fortunate seems to fit the Bamboo culture. During the past few years, said Whitlock, employees have packed about 500,000 meals for starving children, mostly in developing countries, as part of its Rise Against Hunger service project. Employees at Veritas Funding in Midvale never know when the treat trolley might roll through the mortgage lending office. But when it does, it has workers doing a happy dance in their cubicles. Just like the airplane drink carts, the trolley is filled with “every treat you can imagine,” said Douglas, from candy and fruit to chips and nuts. Employees know when the trolley is on its way because it’s always accompanied by music over the office sound system. The treat trolley showed up on Michael Jackson’s birthday with “Thriller” blasting over the speakers; it also made an appearance when the latest “Star Wars” movie was released. New employees push the trolley around the office, Douglas said, handing out bags of Sour Patch candies, peanut M&M’s and pistachios as a way to introduce themselves. Veritas offers other food perks, too. The kitchen is stocked with a soda machine and various syrups as well as free coffee, tea and chocolate. There are monthly luncheons, ice cream socials, potluck parties and a chili cook-off fundraiser.